PBJstories: Come see the little side project I'm working on! Congratulations! That t-shirt is too cute! And so is the little one wearing it! what a great way to announce! congrats! Congratulations! And such a cute announcement. Feel better. I wish I could send you some saltines. Congratulations! I love the special way of announcing it! Congrats!! Will you PLEASE share where you got the shirt?? Would love to get one too!!! Congrats! I am also due February 2013 :) on the 19th! Where did you get that cute shirt? We need one too! Congratulations! 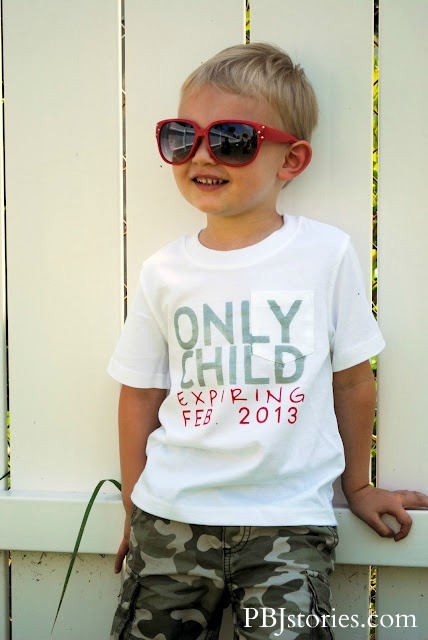 Your little guy and his tee is adorable! Congrats! This tee is too cute, where is it from? I am also curious where the adorable shirt came from???? 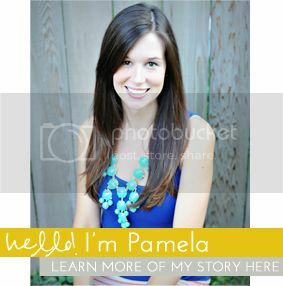 CONGRATS Pamela!!! So excited for you and your growing little family! It was great meeting you at Haven!!! Love the shirt (saw it on pinterest!). Where did you get it? Also saw the shirt on Pinterest. We need it! Where did you find it? Need this shirt as well!! So excited you finally announced to the world! LOVE your shirts. As soon as Mr. Woodsy showed me your post via phone the other day I told him that this was going to be a pinterest sensation! Congrats on the baby and the overwhelming responses to the shirt orders! CONGRATULATIONS!! I see Jackson is all excited too!! What a cute shirt!! Loved it so much that I just made one for my sister!!! Imitation is the highest form of flattery, right? :) Congratulations. How did you make yours? I want to make one, but don't know where to begin? The way I made mine was using a stencil with acrylic paint mixed 50/50 with fabric medium. The medium is important to allow the paint to be "wearable" (has a softer feel) and holds up to washing. I absolutely love the shirt and want to make one also! Could you plz share with us how u made it!! Are you taking anymore orders? Pamela, I cant find your etsy shop info on this post. Please share if you're still willing to create! Are you still making these shirts?? ?